STYLISH LAUNDRY BASKET: Get a stylish laundry bin that fits in with any decor with our Collapsible Laundry Basket. These hampers are designed to stand up even when empty. The material has specially been selected to keep ridged and its shape allowing for a stand-up hamper. However should you want to pack it away, it will fold flat for your convenience. 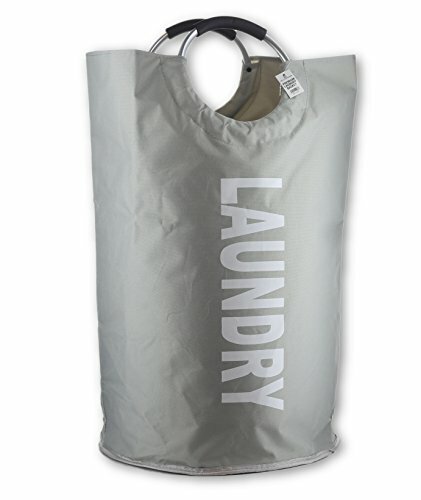 MADE TO LAST: This laundry bag is crafted from a double layer of premium 600D Oxford materials for durable construction that won\'t fade. The hamper\'s design blends with any style space. ALLOY HANDLES AND STURDY BASE: This Laundry basket features strong alloy handles that add a touch of brilliance to your mundane tasks. Weighted base for extra stability and rigidity . Big enough for a small family! I absolutely love this laundry basket!